In the Working with instances chapter, we learned how to created 4 new instances by duplicating or inserting images. Indeed, a right click on the Timeline opens a contextual menu which allows you to Insert instances after the current image. The numeric field below appears. You can Insert one or several empty instances. For the Duplicate option, another field will appear, letting you duplicate one or several instances. Whether they are empty or not, you will have a replica of your current instance (or the selected ones). We also learned that the button creates new empty instances. However, there are alternative methods. • You can simply place yourself on the frame after your first instance and begin a new drawing. A new instance is then created, but containing the previous instance's drawing. We learned before how to erase the content of an instance, it is very easy to start again on an empty area. We may also need the previous drawing to continue the animation. This is possible thanks to the two options (active by default) in the Timeline : Auto break instance ( ) and Auto create instance ( ). 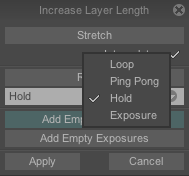 By releasing the click, the Increase Layer Length window will appear. Click on Empty instances, then on Apply. The 15 (depending on your choice) instances will be created. Let's explain this pannel that allows you to act on the instances. Interpolation is nothing but a fade effect computed and applied by TVPaint Animation to fill the intermediary images which will be inserted between the original images. By clicking on Hold, you will open a sub-menu that gives you 3 other choices : Loop, Ping-pong and Exposure. The next example gives you an idea of the effects produced by the various options. Original Layer to be stretched to the right. 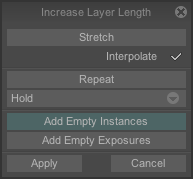 Even if these process have been explained to create instances from the left to the right, it's also possible to created instances from the right to the left, using the left strip.